Residents either dropped their jaws or quickly cleaned their bifocals to see if they were reading the numbers correctly when the recent property evaluations were picked up in mailboxes in the Brome Lake area. Many folks stared in disbelief, as if they were witnessing a UFO descending over Mount Glen, at the huge increases in property evaluations they were seeing that went beyond any relation with the rate of inflation, wages or cost of living index. Reports of property evaluations jumping by up to 300% are coming forward as residents start to compare their new tax burden and are starting to see a similar pattern: property taxes are through the roof in a seemingly arbitrary manner that some say smacks of an indecent tax-grab. Astounded property owners are asking themselves how it is possible that the evaluation of their properties can more than double within a year since the last evaluations. With more and more homes that are put up for sale staying on the market for longer and longer even when sellers drop prices it would seem that there is actually an over-estimation on home values in the area so when a homeowner drops a sale price by $20,000 and still can't sell and then sees the taxes on that property almost double due to an evaluation that doubled it can leave one scratching their head. During council meetings property owners are expressing anger and disbelief at the evaluation process that seems to make little correlation to reality beyond the reality of allowing the Town of Brome Lake to quickly increase revenue at a record rate! 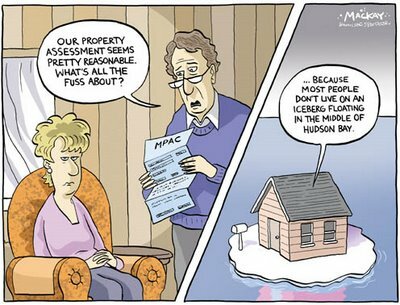 Even when council is pressed for answers as to why the property evaluations in the Brome Lake area jumped faster, often doubling or tripling, compared to the averages in the rest of the province they had few answers instead preferring to point their fingers at the evaluation firm that performed the evaluation. The town manager didn’t share the feelings of dismay of taxpayers, which is understandable since the tax coffers of the town will need to be renovated to accommodate the huge increase in tax income, and suggested that taxpayers who felt their evaluations were un-fair could contest the evaluation (for a fee naturally). One resident explained that the a source at city hall had informed them that indeed they could contest the evaluation hike but it would likely be futile; as long as the new evaluation was below the price paid for the home or property, then the contestation would likely fail. This means that a couple who bought a house in Knowlton for $300,000 in 2006 that was evaluated at the time for $190,000 could have seen their new property evaluation for 2007 jump to $299,500 and even though the couple felt that it was an unfair jump they would, according to the source at city hall, lose any contestation of the evaluation because the evaluation was lower than what they paid! As new properties and homes are sold based on the new evaluations the neighboring properties will have their evaluations increase as well as according to the evaluators fuzzy logic. The town puts their own spin on the situation by pointing out that while evaluations have gone way up the actual rate has dropped. While this a point the town tries to make over and over again most folks see the reality differently no matter how it's spun: taxes are up….way up! One new resident to Knowlton was shocked: "We bought land in Lac Brome 6 months ago that was evaluated at $28,000 and this year’s evaluation has gone to $62,000. We haven’t even built yet and our tax on the land is up 90%. If the cost of fuel or food or insurance went up by even 20% people would be raising a big stink but this government seems to think they can allow an outrageous increase into our taxes and we’ll sit back and just open our check books!" What he and others feel is frustrating is the appearance that the city councilors want to wash their hands of any responsibility saying it is the evaluators who decide and we all have to go along with it. Of course the town managers would like everyone to quietly follow along with paying more taxes but more and more residents, as they compare evaluations with friends and neighbors, are actually starting to demand answers. Answers are something hard to come by when officials and evaluators seemingly "work together" to create conditions that increase taxes and perhaps if protesting, contesting or refusing to pay the taxes doesn't work then residents will just have to bite the bullet and wait for the next elections to inflict judgment on the council.